You are here: Home / Diary / Our New Food Bowls! 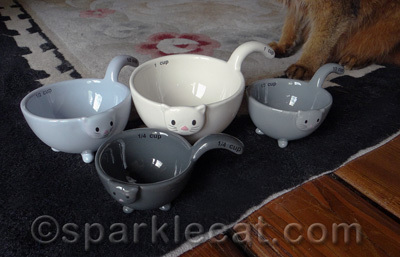 My human saw these awesome kitty serving bowls on a blog post from my pals at A Tonk’s Tail — and she actually ordered them! It is about time we had some nice looking bowls. Binga is already wondering where the food is. Oddly enough, however, they are all different sizes. Maybe that is because the cats here are all different sizes! And I imagine the smallest bowl is for treats. Binga says she has dibs on the big bowl. We shall see about that. Wait a minute! You mean they are not kitty serving bowls? I know! My human uses them for human baking! SO-NOT-RIGHT! What an adorable set! I’m sure that you guys will enjoy them. Definitely kitty bowls. Good luck with that, Sparkle! Oh you had us going there for a minute, now we get it! They sure are cute, we love them! That’s just crazytalk, Sparkle. Of course they’re for you! Those are very cute bowls. I think you should have them and not the Human. Those bowls are sure cool and I am more than ready to eat! What a cheek!!! They got kitties on the sides!!! They belong to you!! We think your human is just joking with you kitties. How could those NOT be for eating? Ohhh, these bowls are really cute ! Mum loves it, and we do too. Oh Sparkle, I’ve seen cute “bowls” like that too and often figured I would break them if I tried to use them. I never thought about using them as food dishes – I think that’s a fantastic idea! They are bowls and there’s kitties on them so why aren’t they kitty bowls? Hmmm. HAH! I was gonna say they looked like measuring cups. They’re WAS too small for food. LOVE those bowls! AND of course that Binga always makes me smile! What?!? We think they’re yours!!! Happy Furday! We think that they so ARE kitty serving bowls!!! 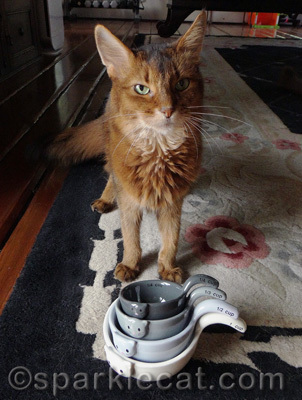 I wondered about that too – Kitty bowls for humans? Let ’em eat kibble! 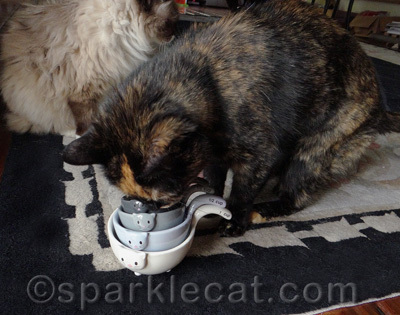 Good heavens – if they are not for kitties, then what good are kitty bowls! Humans – who can ever figure them out. MOL! Wow, those are adorable! MomKatt says she could see Miso Soup in them!!!!! Ha!!! I was just going to tell you that they aren’t for kitties!!! roflmao! Those are way cool…..well, if your human insists on keeping them for herself, the least she could do is PREPARE treats in them for YOU! Right? Right! Those are adorable..mommy is jellis! If they aren’t kitty serving bowls…they ARE now! Fill ‘er up!! We think you should insist those bowls are for your use only – if not the humans will try and steal them from you to use for themselves. 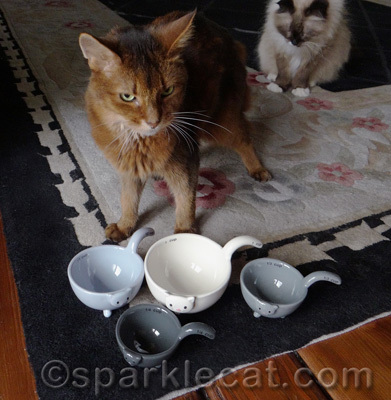 We think that kitties could eat out of those bowls. What is the deal?? They look good enough for us to eat out of so just fill them up. They are really cute. Take care. The head peep just squeed when she saw those. So much more cute than the stainless steel bowls we eat from now. Why would a human buy a bowl that is not a kitty bowl? It just does not make sense. Why do humans make kitty things for themselves?! !